I’m one of those people who will order an entree just because of the side dishes. As delicious as filet mignon or prime rib can be, give me the loaded baked potato or garlic mashed potatoes, and you could forget the steak, and I might not even notice. And that is precisely why I love barbecue so much: the potato salad, coleslaw, mac and cheese, corn bread, hush puppies if I’m really lucky. The list of delicious sides goes on and on. 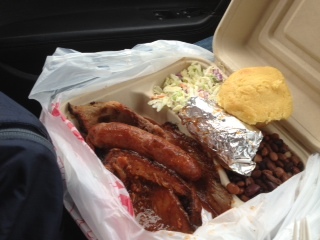 With that in mind, I’m so happy I found Gorilla BBQ in Pacifica. Housed in a little train car on Highway One, Gorilla BBQ was featured on Diners, Drive-ins and Dives back in 2009, and I sure wish I had made the trip sooner! While the meant options that we tried (hot links and beef brisket) were great, Gorilla BBQ is also a non-meat lover’s barbecue heaven. 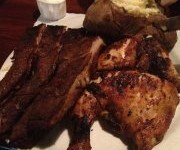 I know vegetarians don’t usually look for recommendations on barbecue, but this is the place for just that situation as they offer a veggie combo that allows you to choose from a main dish of grilled zucchini, portabella mushrooms or eggplant, plus two sides, which can include the other veggies, or any of their regular options. Finally, we get to the sides! Most of the combos automatically come with cornbread, which was quite delicious, and beans and rice, which were also really good. For my additional sides, I ordered the potato salad, which was a classic take and a definite winner, and the mac and cheese. Unfortunately, that is where this story takes a sad turn – THEY FORGOT MY MAC AND CHEESE. Mac and cheese is a food of the gods as far as I’m concerned, so I take it very seriously. I really built the whole meal around the mac and cheese, but because it is take-out only, I didn’t inspect the contents of my meal before I left. But mac and cheese crisis aside, I still enjoyed the rest of the meal and I had room to try my dining companion’s coleslaw, which was also really good. So overall, Gorilla BBQ is a great option for meat lovers and vegetarians. The sauce is amazing, so if you make the trek, definitely get a bottle or 100 to go. Just make sure you have somewhere nearby to eat because with to-go being your only option, the delicious barbecue smell will be a huge distraction while you are driving. Trust me; we ended up eating at the beach. But luckily the folks at Gorilla BBQ were very generous with the napkins.